Do you have a photography lover on your holiday list? If so, we’ve got the smarts on photography gifts they (and you) are sure to love. 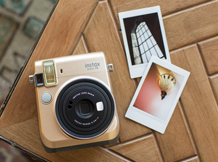 Instant cameras are still so popular amongst teens, tweens and wannabe younger siblings. I recommended two the Fuji Instax Mini 8 and the Fuji Instax Mini 90 in my 2015 Photography Gift Guide. These instant cameras are still top sellers and at around $60, the Mini 8 is pretty affordable. Both come in lots of new shapes, sizes and colors, as well as a whole host of accessories. 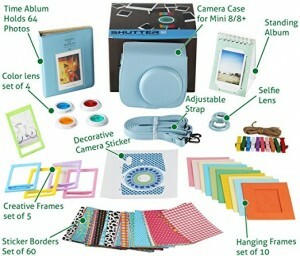 I just saw the 9-piece set, accessory-only bundle (camera sold separately) pictured above for around $50 on Amazon. It includes a case, two albums, selfie lens, 4 colored filters, 10 wall hang frames, 60 stickers and more. Now that’s fun. New this year is the sleek, modern Fuji Instax Mini 70. It’s a great hybrid – in both price and features – of the two instant cameras mentioned above. Pricewise at around $100, depending on color preference and retailer, it falls right between the Mini 8 ($60) and Mini 90 ($125-$150). It has many of the upgraded features of the Mini 90 such as macro mode, landscape mode, self timer and a selfie mirror, but lacks a few creative features such the ability to produce long exposures and double exposure images. The Instax Mini 70 features a new ‘Selfie’ mode for taking perfect selfies (just what we all need, right? More kids taking selfies.). Just press the selfie button when shooting and the camera will automatically adjust the focal length and brightness to the ideal level for selfies. If selfie stardom is something your photography lovers aspire too, then you are welcome! I like the Mini 70’s new “Fill-in-Flash” feature, which supposedly eliminates “blown out” (aka overexposed) faces against bright backgrounds. 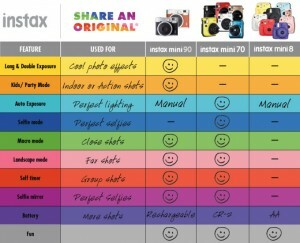 Instant cameras have historically never provided much flash control so this sounds like an awesome upgrade to me. Remember how we all resembled ghosts in 80s Polaroid pictures? In theory, this feature should remedy that interesting look. This Fuji chart compares all three models. I own the Mini 90 so Fuji Instax is simply what I know. 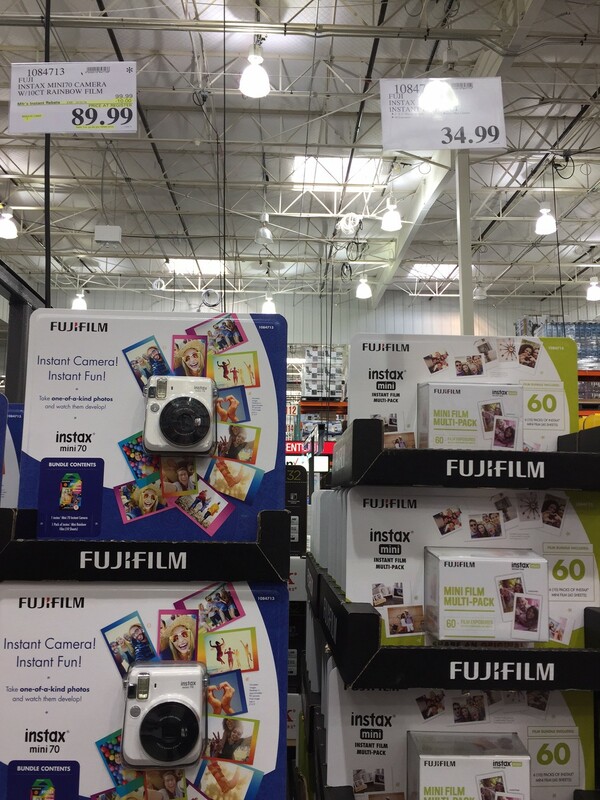 Smarty Shoppers Alert: On Saturday, I found two great deals at Costco in Matthews. 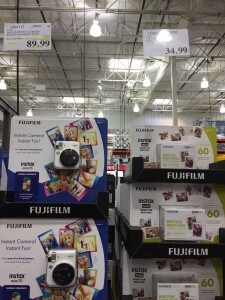 The Mini 70 (in white only) was on sale for $89.99 including a pack of rainbow film. Right beside it was a 60-count pack of regular film for $35.99. That’s almost half price!! See below for more on film. If you already own an instant camera or plan to buy one, then my next suggestion makes a perfect stocking stuffer. Film. They need film. Both your kids and mine have been out of film for months now because it’s expensive. They “need” us to buy it. At an average of $1 per picture, a 20-count box is $20. Again Amazon often bundles film, so research to find the best deal. Fuji Instax film comes in so many cool designs, all which add even more fun to the photo process. Film designs like Comic Film, Stained Glass Film, Rainbox Film, Candy Pop Film and more can all be viewed on Fuji’s website under Products/Instax Film. Amazon has a rainbow/stained glass/shiny star (10 count each) bundle for $30. This camera doesn’t need film. It simply requires an expensive upgrade (at least that’s what Santa told me). If an iPhone makes anyone’s short list, just know that the camera in the iPhone 7 is getting rave reviews from every one, everywhere. Don’t get me wrong, smart phone cameras still can’t compete with DSLRs or high-quality mirrorless cameras, but it’s hard to beat the ease and convenience of the iPhone. Plus I don’t carry my professional camera all day, every day. For better or for worse, my iPhone I do. I could bore you with all the technicals of how the iPhone 7’s camera lets in more light, performs better in low light situations, etc. but trust me. If you are in the market for a new smart phone and camera quality matters, just upgrade. Maybe just forward this section to my husband too please. PicTapGo ($1.99) – make adjustments to color, contrast, warmth and more plus lots of preset filters you can adjust to your own style. Whether you are gifting instant cameras or smart phone cameras, it’s all about the accessories this year – the themed film, the apps and the cool filters. Take this smarty knowledge and go conquer your holiday list. Abbe McCracken is a Smarty Mom and the two-time winner of our very own Charlotte Smarty Pants’ Best Family Photographer (2016, 2015). She specializes in joyful family and children’s photography for the Charlotte metro area including Matthews, Ballantyne, Weddington and beyond. 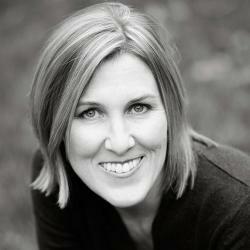 Abbe lives in Matthews with her husband Ryan, their two human whirlwinds and one fluffy canine. Smarties – you can follow Abbe McCracken Photography on Facebook, Instagram, Twitter and Google+. From our Smarty friends at the Charlotte Mecklenburg Library: Volunteer Opportunities for the Whole Family! President’s Day – A Splash of Fun!